In lesson 12, when studying the Center Blur effect, we already discussed the idea that an effect may make use of the Position parameters which will then define a path on the screen. We will now discuss this Path notion in more detail. When an effect authorizes use of a path(s) for one or several of its parameters, you have access to the Tools menu in the panel of the corresponding effect as shown opposite. * You may use the Pixel tracker to create a path. * You may also record a stroke on the screen, to create a path. * The third option of the Tools menu allows you to re-use a path you have already created previously in your effects stack and use it with the current parameters. * As is the case for the palettes, the tool settings, the effects, etc, a path may be renamed, saved, etc. The option Path Manager is used for all these tasks. * The option Add to bin allows you to save the current path under a name of your choice for later use (we have already done the same for customized palettes, mixers, tools ..... ). 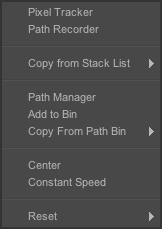 * The Copy from path bin allows you to re-use a path saved in the Bin for your position parameter. 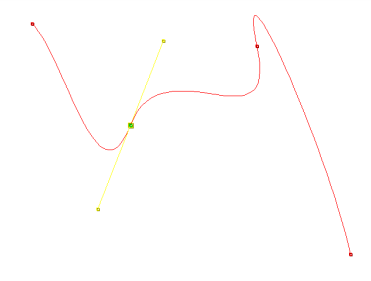 * The Center option replaces the position values for the current key with those of the center of the image. * The Constant Speed option allows you to replace all the position values of the keys along the path, to have always the same distance between 2 adjoining frames. * The Reset option deletes all the keys of your effect.